The CSG rapier curriculum is drawn from the great Italian masters of the turn of the 17th century, particularly the work of Grand Master Salvator Fabris (1544-1618) from Padua, Italy, who arguably became the most internationally-celebrated teacher of the new style. The roster of his princely pupils included the Archbishop of Bremen and Christian IV, King of Denmark, under whose patronage he published his exceptional rapier-fencing manual Lo Schermo, overo Scienza d’Arme (“On fencing, or martial knowledge”). 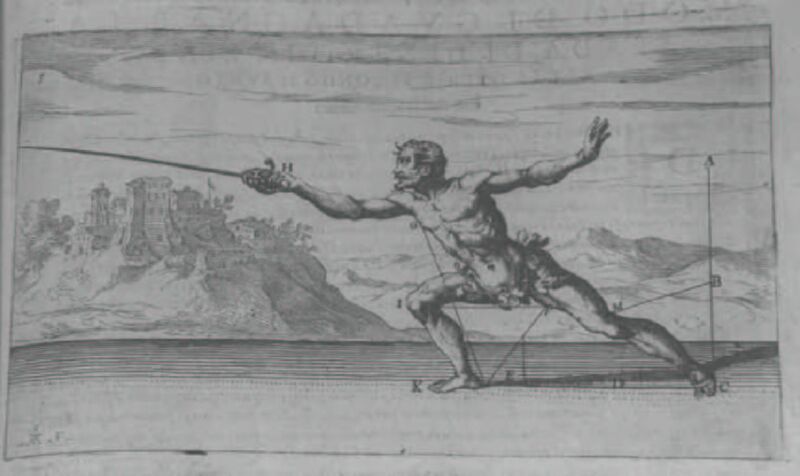 Fabris’ manual became an instant-bestseller around European fencing circles; it was re-printed continually from 1606 to 1713, translated into several languages, imitated and even plagiarized, as Fabris’ style spread throughout the continent. The modern popularization of Fabris and his work has been largely driven by one of the CSG’s sister-schools,The Order of the Seven Hearts. In the “chicken and egg” question of rapier evolution, the origin of rapier fencing can be traced to a change in tactical focus. A greater emphasis on unarmoured, civilian dueling led to changes in the technical elements of the old Dardi School. The architect-turned-fencing theorist, Camillo Agrippa, best expressed this evolution by placing an emphasis on the thrust, and reducing the many guards of the old Bolognese system to adaptations of those four that best kept the point constantly in play. Although the rapier was occasionally taught with buckler and shields until well into the seventeenth century, it was generally used either alone, or in conjunction with the sidearms a gentleman would most likely have with him at all times, the cloak and dagger. 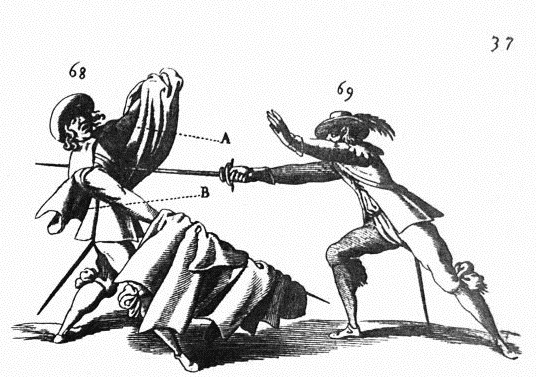 In his Lo Schermo, overo Scienza d’Arme (“On fencing, or the knowledge of arms”), Salvatore Fabris presents a detailed yet concise, and surprisingly modern explanation of the guards, measure, tempo, strengths and weaknesses of blade-sections and blade-angles and line, combined with a vast technical repertoire for using the rapier alone, and in conjunction with both the dagger and the cloak. Throughout his work, Fabris’ preference is for actions made in tempo. This means that he seldom advocates parrying and riposting as two consecutive movements – rather, he executes them both in one motion, i.e. in a single tempo. The resulting style, once mastered, is extremely hard for an opponent to defeat. Once this new method of fencing was born, the sword began to adapt to fit the method’s ideals. The rapier was a weapon in almost constant evolution from its birth in the mid-16th century, until its gradual replacement by the smallsword in France, England and Germany at the end of the seventeenth century, and the spada da terrena (dueling sword) in Italy during the waning years of the eighteenth. Generally speaking, a rapier is a long-bladed sword with a complex hilt, optimized for the thrust but still capable of debilitating cuts. The blade is fairly thin and stiff, and counter-balanced to provide greater point control. Rapiers were neither light nor flimsy; a typical rapier of c.1600 had a blade of 42″ in length, a weight of 2.5 – 3 lbs, and was capable of parrying the blows of broad-bladed military swords, including the now old-fashioned longsword. The rapier’s swept hilt was a direct inheritance of the innovations made to the arming sword at the turn of the 16th century, and this in turn was replaced by the cup-hilt in second quarter of the 17th century. 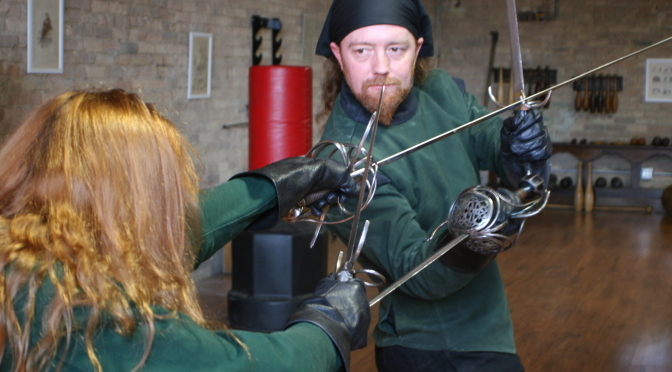 The rapier is one of the two points of entry into the Guild for novices (the other being the medieval longsword, as taught by Fiore dei Liberi). In keeping with Fabris’ advice, rapier students begin with the sword alone, only adding the dagger after proficiency with the sword is developed. 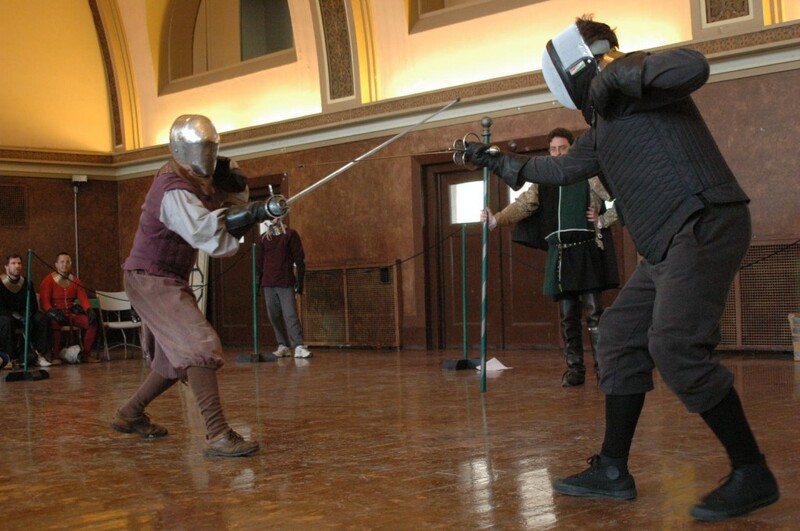 Also in keeping with the custom of fencing schools in the late 16th century, students also learn basic grappling, dagger and counter-dagger fighting, concurrent with learning the sword. Biographies of Salvatore Fabris, Nicoletto Giganti and Ridolfo Capoferro. Tom Leoni’s magnificent translation of Nicoletto Giganti’s Schola, overo Teatro is available from Freelance Academy Press. A working translation of Capo Ferro by William Wilson and Jherek Swanger. A Glossary of rapier terms. A Collection of most of the Italian fencing terms used in the various Renaissance fencing treatises from 1500 onward. The Rapier web page at the The Order of the Seven Hearts. Highly recommended! No one has done as much to popularize and promote the Fabris method of rapier fencing as Tom Leoni, and he and his senior provost, Steve Reich, have also developed and excellent article database on their webiste. Or particular interest should be Steve’s Starting in Italian Rapier and Tom’s articles Tactical Advice for the Rapier and The Most Common Mistakes of Beginning Rapier Students.